On any given day in West Urbana, it's not unusual to see scores of students walking to school while their parents walk or bike to work. The neighborhood's walkways, narrow streets, and picturesque shade trees and landscaping make it desirable for foot traffic and contribute to the sense of place found here. Located between two dynamic areas — the University of Illinois and downtown Urbana — West Urbana has maintained its unique neighborhood identity for more than a century, refusing to succumb to the pressures of high-density development or issues surrounding absentee landlords. Many historic properties remain today, the result of an active citizenry and sustained planning efforts. The American Planning Association has selected West Urbana as one of 10 Great Neighborhoods in America for 2007 in recognition of the neighborhood's sustainable design; commuters who walk, bike, or ride transit at higher-than-average rates; inviting neighborhood spaces; and community focus on enhancing quality of life. Fall colors. Courtesy of Robert Olshansky. 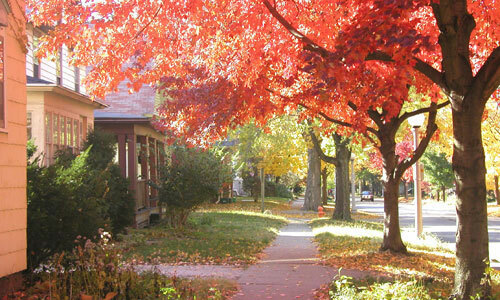 A traditional residential neighborhood, West Urbana is best experienced on bike or foot. Nearly a quarter of commuters here don't use a car — about triple the national average. Children walk in groups to the local elementary school, an Art Deco-designed building from the 1930s federal Work Projects Administration (WPA). The high school and middle school also are within walking distance. The neighborhood's design encourages foot travel. A discontinuous grid pattern with T-intersections in key places to discourage cut-through vehicle traffic provides connectivity and easy navigability. Mature trees form a canopy over narrow streets while some streets and sidewalks feature restored brick. Historic, globe-style streetlamps and front porches combine to create an inviting streetscape for walkers, who often stop to chat with neighbors. To promote additional bicycle and pedestrian use, the city is developing a bike master plan and, as streetscapes are updated, bike lanes and bump-outs are being constructed to improve safety and enhance accessibility. Non-residential features, such as the Urbana Free Library, also contribute to the neighborhood's strong sense of place. Founded in 1874 and recently renovated and expanded, the library has one of the highest usage rates in the nation. Another feature is Carle Park — home to an arboretum, historic pavilion, and a Laredo Taft sculpture of Abraham Lincoln. 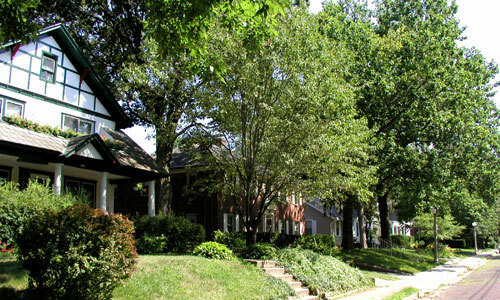 From small, affordable homes to large, historic properties, houses in West Urbana are incredibly diverse and attract a wide cross-section of residents — traditional and single-parent families, couples, seniors, and individuals. Once viewed as a "faculty ghetto" because of its proximity to the university, the area is no longer dominated by a single employer. Streetview. Courtesy of Ryan Brault. Like many neighborhoods near college campuses, West Urbana was threatened by demolitions and increased density as single-family homes were converted to student housing. As other historic neighborhoods to the north and west were lost to campus expansion and other changes, West Urbana residents banded together in the early 1980s to convince city leaders to downzone the neighborhood in order to stem higher density development. The Downtown to Campus Plan, adopted in 1990, amended existing zoning to include "mixed office-residential" to promote adaptive reuse of older homes along Elm and Green Streets, and "campus commercial" to the north and west to provide an area where new student apartments would be allowed, relieving some development pressure in the neighborhood. Looking to the future, the City of Urbana's 2005 Comprehensive Plan recommends creation of a West Urbana neighborhood conservation district and design guidelines for the Lincoln-Busey corridor. A conservation district ordinance would allow residential areas, which do not qualify for historic district status but that have unique qualities, to be protected by design review requirements. To make the neighborhood more sustainable, an ordinance was amended to promote the use of permeable pavement. Other amendments are being prepared to encourage the use of solar collectors and wind turbines. Making a great neighborhood isn't magic but, as West Urbana shows, it takes a community where residents are involved with their neighborhood and plan for its future. 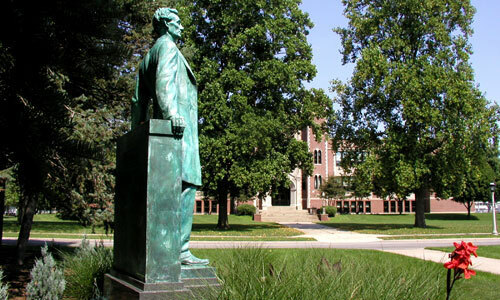 The Lincoln statue in Carle Park opposite the high school.